Types are indexed by their order of appearance in .debug$T plus 0x1000. Type indices less than 0x1000 are "simple" types, composed of a SimpleTypeMode byte followed by a SimpleTypeKind byte. Definition at line 95 of file TypeIndex.h. Definition at line 103 of file TypeIndex.h. Definition at line 104 of file TypeIndex.h. Definition at line 105 of file TypeIndex.h. Definition at line 107 of file TypeIndex.h. Definition at line 185 of file TypeIndex.h. Definition at line 186 of file TypeIndex.h. Definition at line 122 of file TypeIndex.h. Referenced by llvm::codeview::LazyRandomTypeCollection::capacity(), llvm::codeview::TypeTableCollection::getFirst(), llvm::codeview::LazyRandomTypeCollection::getFirst(), llvm::codeview::LazyRandomTypeCollection::getNext(), llvm::codeview::AppendingTypeTableBuilder::nextTypeIndex(), llvm::codeview::MergingTypeTableBuilder::nextTypeIndex(), llvm::codeview::GlobalTypeTableBuilder::nextTypeIndex(), and llvm::codeview::TypeDumpVisitor::visitTypeBegin(). Definition at line 110 of file TypeIndex.h. Referenced by copyBytesForDefRange(), emitNullTerminatedSymbolName(), llvm::format_provider< codeview::TypeIndex >::format(), llvm::DenseMapInfo< codeview::TypeIndex >::getHashValue(), llvm::codeview::CodeViewRecordIO::mapInteger(), llvm::codeview::printTypeIndex(), slotForIndex(), llvm::codeview::TypeDumpVisitor::visitTypeBegin(), and llvm::codeview::ContinuationRecordBuilder::writeMemberType(). Definition at line 126 of file TypeIndex.h. Referenced by llvm::pdb::SymbolCache::createGlobalsEnumerator(), llvm::pdb::NativeTypeEnum::getBuiltinType(), shouldEmitUdt(), and simpleTypeName(). Definition at line 131 of file TypeIndex.h. Referenced by llvm::pdb::SymbolCache::createGlobalsEnumerator(), llvm::pdb::NativeTypeEnum::getBuiltinType(), llvm::pdb::NativeTypePointer::getLength(), llvm::pdb::NativeTypePointer::NativeTypePointer(), shouldEmitUdt(), and simpleTypeName(). Definition at line 166 of file TypeIndex.h. Definition at line 172 of file TypeIndex.h. Definition at line 174 of file TypeIndex.h. Definition at line 178 of file TypeIndex.h. Definition at line 180 of file TypeIndex.h. Definition at line 113 of file TypeIndex.h. Definition at line 115 of file TypeIndex.h. Referenced by llvm::codeview::AppendingTypeTableBuilder::contains(), llvm::codeview::MergingTypeTableBuilder::contains(), llvm::codeview::GlobalTypeTableBuilder::contains(), llvm::codeview::LazyRandomTypeCollection::contains(), llvm::format_provider< codeview::TypeIndex >::format(), llvm::codeview::TypeTableCollection::getTypeName(), llvm::codeview::LazyRandomTypeCollection::getTypeName(), llvm::codeview::printTypeIndex(), and simpleTypeName(). Definition at line 112 of file TypeIndex.h. Referenced by llvm::codeview::LazyRandomTypeCollection::capacity(), llvm::codeview::AppendingTypeTableBuilder::contains(), llvm::codeview::MergingTypeTableBuilder::contains(), llvm::codeview::GlobalTypeTableBuilder::contains(), llvm::codeview::LazyRandomTypeCollection::contains(), llvm::pdb::SymbolCache::createGlobalsEnumerator(), llvm::pdb::SymbolCache::findSymbolByTypeIndex(), llvm::format_provider< codeview::TypeIndex >::format(), llvm::pdb::NativeTypeEnum::getBuiltinType(), llvm::codeview::LazyRandomTypeCollection::getNext(), llvm::pdb::TpiStream::getType(), llvm::codeview::LazyRandomTypeCollection::getType(), llvm::codeview::TypeTableCollection::getTypeName(), llvm::codeview::LazyRandomTypeCollection::getTypeName(), llvm::pdb::NativeEnumTypes::NativeEnumTypes(), llvm::pdb::NativeTypePointer::NativeTypePointer(), llvm::codeview::printTypeIndex(), shouldEmitUdt(), simpleTypeName(), slotForIndex(), and llvm::codeview::LazyRandomTypeCollection::tryGetType(). Definition at line 136 of file TypeIndex.h. Definition at line 160 of file TypeIndex.h. Definition at line 138 of file TypeIndex.h. Definition at line 147 of file TypeIndex.h. Definition at line 193 of file TypeIndex.h. Definition at line 198 of file TypeIndex.h. Definition at line 188 of file TypeIndex.h. Definition at line 210 of file TypeIndex.h. Definition at line 215 of file TypeIndex.h. Definition at line 204 of file TypeIndex.h. Definition at line 111 of file TypeIndex.h. Definition at line 154 of file TypeIndex.h. Definition at line 70 of file TypeIndex.cpp. References assert(), llvm::codeview::Direct, getSimpleKind(), getSimpleMode(), isNoneType(), isSimple(), and NullptrT(). Referenced by llvm::format_provider< codeview::TypeIndex >::format(), llvm::codeview::TypeTableCollection::getTypeName(), llvm::codeview::LazyRandomTypeCollection::getTypeName(), and llvm::codeview::printTypeIndex(). Definition at line 117 of file TypeIndex.h. Referenced by llvm::codeview::LazyRandomTypeCollection::capacity(), llvm::codeview::TypeTableCollection::contains(), llvm::codeview::AppendingTypeTableBuilder::contains(), llvm::codeview::MergingTypeTableBuilder::contains(), llvm::codeview::GlobalTypeTableBuilder::contains(), llvm::codeview::LazyRandomTypeCollection::contains(), llvm::codeview::TypeTableCollection::getNext(), llvm::codeview::LazyRandomTypeCollection::getNext(), llvm::codeview::LazyRandomTypeCollection::getOffsetOfType(), llvm::codeview::TypeTableCollection::getType(), llvm::codeview::AppendingTypeTableBuilder::getType(), llvm::codeview::MergingTypeTableBuilder::getType(), llvm::codeview::GlobalTypeTableBuilder::getType(), llvm::codeview::LazyRandomTypeCollection::getType(), llvm::codeview::TypeTableCollection::getTypeName(), llvm::codeview::LazyRandomTypeCollection::getTypeName(), llvm::codeview::MergingTypeTableBuilder::insertRecordAs(), and llvm::codeview::LazyRandomTypeCollection::tryGetType(). Definition at line 169 of file TypeIndex.h. Definition at line 173 of file TypeIndex.h. Definition at line 175 of file TypeIndex.h. Definition at line 179 of file TypeIndex.h. Definition at line 181 of file TypeIndex.h. Definition at line 157 of file TypeIndex.h. Definition at line 139 of file TypeIndex.h. Definition at line 140 of file TypeIndex.h. Definition at line 143 of file TypeIndex.h. Definition at line 163 of file TypeIndex.h. Definition at line 225 of file TypeIndex.h. Definition at line 245 of file TypeIndex.h. Definition at line 251 of file TypeIndex.h. Definition at line 258 of file TypeIndex.h. Definition at line 229 of file TypeIndex.h. Definition at line 233 of file TypeIndex.h. Definition at line 221 of file TypeIndex.h. Definition at line 237 of file TypeIndex.h. Definition at line 241 of file TypeIndex.h. Definition at line 100 of file TypeIndex.h. Definition at line 97 of file TypeIndex.h. Referenced by llvm::pdb::TpiStreamBuilder::addTypeRecord(), llvm::codeview::AppendingTypeTableBuilder::getFirst(), llvm::codeview::MergingTypeTableBuilder::getFirst(), llvm::codeview::GlobalTypeTableBuilder::getFirst(), and slotForIndex(). Definition at line 98 of file TypeIndex.h. 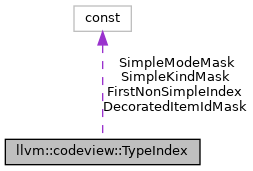 Definition at line 99 of file TypeIndex.h.